Pence’s speech, though, suggested to many that NASA had such a plan already. “But Administrator Bridenstine told me, five minutes ago, we now have a plan to return to the moon,” Pence said. Bridenstine said that plan Pence mentioned referred to the earlier goal of humans on the moon by 2028. NASA is working quickly to put together that new plan for a 2024 landing. “We’ve got to go fast: a couple of weeks,” Bridenstine said. NASA will then work with the White House, including the Office of Management and Budget, to develop a “consolidated position from the administration” on that approach, and its cost, before delivering it to Congress. 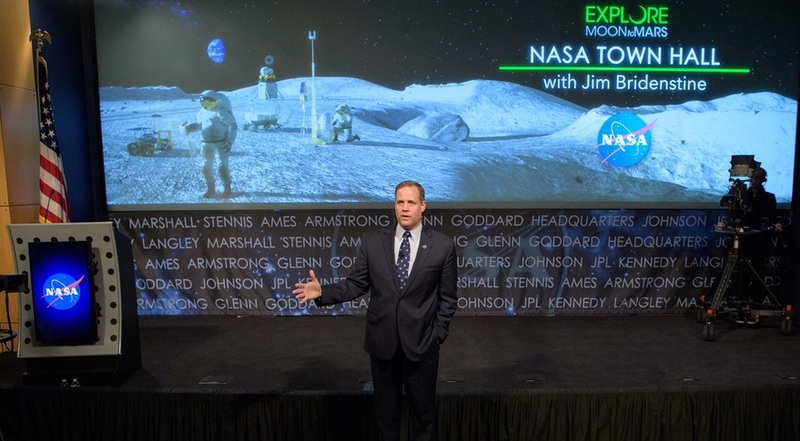 As an example of “taking nothing off the table,” Bridenstine discussed at the town hall meeting the two-week study that looked into commercial alternatives to the Space Launch System for the Exploration Mission (EM) 1 flight. That examined a wide range of options, including use of both United Launch Alliance’s Delta 4 Heavy and SpaceX’s Falcon Heavy, but most suffered from a number of technical or logistical issues that kept them from being able to accelerate the schedule for EM-1. “There is nothing sacred here that is off the table,” he argued at the town hall meeting. He added, though, that the “best option” to getting to the moon as soon as possible remained the SLS, and that NASA was continuing efforts to find ways to accelerate its development. “We will need more resources if we’re going to the moon in 2024,” he said. In both that speech and the earlier town hall meeting, he said he anticipated NASA would start the 2020 fiscal year in October on a continuing resolution, which funds programs at the same level as the previous fiscal year and typically does not allow new programs to start. He said NASA would seek an “anomaly,” or exception, in that continuing resolution to allow the agency to move ahead on its accelerated lunar plans. Bridenstine was speaking to an audience wary about such cuts given that, for the second year in a row, NASA’s budget request proposed terminating the Wide Field Infrared Survey Telescope (WFIRST), the next large astrophysics mission after the James Webb Space Telescope. Bridenstine said that decision was linked to cost overruns with JWST and not the agency’s exploration plans.